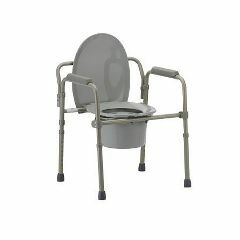 Seat height adjusts from 16" to 20"
The Nova Folding Commode provides you with a durable and high quality frame and commode at a very affordable price. It folds easily and quickly making it ideal for travel and easy storage. The Nova Folding Commode fits over your existing toilet, so everyone in your household can use it. Seat height adjustable: 16" - 23"
It's seemingly sturdy. It folds up for travel. To fold must adjust legs. It's heavy. It's starting to rust. Bucket doesn't fit well. It folds so that it fits in the car for travel. It's a sturdy commode--not so good for travel shower stool (started rusting after only one use, despite drying well). Asked on Feb 2, 2014 4:09:39 PM by Jeannie from Bend,OR 97701. Is there an open front seat for this chair? Is there a larger toilet seat for this model?